Home > Help > How should I set up my artwork? Can I hire you to create a logo/artwork for me? IMPORTANT: Please read our Artwork Policies before submitting any art. You can also download a PDF version of our Artwork Guidelines. It is the customer's responsibility to understand and comply with all of Firefly Graphics artwork requirements. File Submission: All files can be uploaded directly when purchasing your product, via the product page. Alternatively, you may use our FTP to upload very large files. Acceptable File Formats: Adobe Illustrator (.ai), Adobe Photoshop (.eps), Flattened and Compressed TIF (.tif), Portable Document Format (.pdf), High resolution JPEGs (.jpg, .jpeg). We do not accept the following files Adobe InDesign, PowerPoint, Microsoft Word, Microsoft Publisher, or CorelDraw. Templates: For an easier and faster printing process, please use our templates when submitting. When using scaled down templates, please adjust image resolution accordingly. You may download our PDF templates and easily edit them in a program such as Adobe Illustrator or Photoshop. Colors: Firefly Graphics uses digital inkjet technology using CMYK color model to produce its printing. Pantone or other spot colors provided by our customers will be reproduced using the CMYK equivalent. Because of differences in equipment, processing, proofing substrates, paper, inks, pigments, and other conditions between color proofing and production pressroom operations, a reasonable variation in color between color proofs and the completed job shall constitute acceptable delivery. Firefly Graphics will make every effort to produce a reasonable representation; however, we do not guarantee color matching. We accept no responsibility for color variations between submitted images and the actual artwork or product they represent. 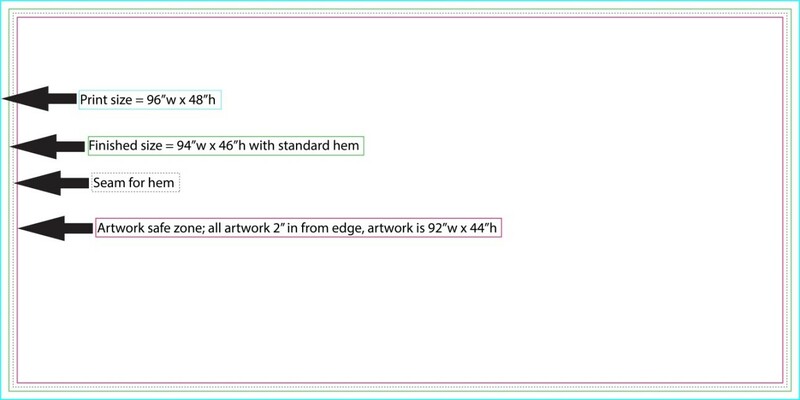 Images: Linked Graphics - Be sure to include or embed all of your placed / imported images when you send your artwork. Actual Sizing: Please note that the final size of your banner will be 2” shorter than your print file. If you order a 96”w x 48”h banner you final size will end up at 94”w x 46”h. If you have an exact size you need your banner to be please put it in your P.O.